News from Fun-Fun Mountain: An interview with FoxTrot’s Bill Amend! I’ve been a FoxTrot fan since mid-to-late 1989, when my Calvin & Hobbes calendar was nearing the end of its useful days and I tapped FoxTrot‘s “Slug-Man: The Calendar” as its successor. I don’t think our local paper actually ran FoxTrot at the time – in fact, the calendar may have been my introduction to the strip. That creator Bill Amend not only invented a character (10-year-old Jason Fox) geeky enough to create his own comic book hero, but also turned out a series of illustrations and story panels as done by that character just struck me as incredibly original and fun. And since Jason was a Star Wars fan and a computer nerd and a role-playing game enthusiast, it was easy for me to get hooked. Bill Amend and FoxTrot: Click on the image to read my GeekDad interview. 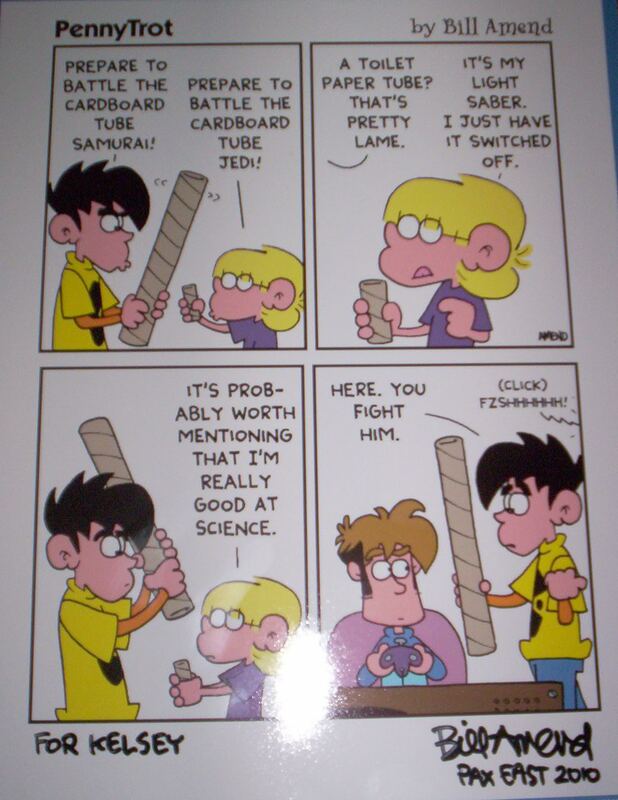 Back in February, this Avatar-inspired strip sparked a goofy sort of thought in my head about how lucky Jason Fox has been, since he’s gotten to remain a young fan over all these years, and he was as excited about Avatar as he was about the Super Nintendo and the Lord of the Rings movies. And then I started thinking about how I’d love to talk to Bill about the geeky aspects of the comic strip, especially since at the time, all the PAX East news was just coming out, and he was going to be there. So I sent him an email, and he said yes, and though it took awhile to come together, what with the insanity of planning his panel and traveling to and from PAX, and then the launch of the latest FoxTrot book and all, it finally did happen, and the whole interview is up at GeekDad. I’ve been awfully excited about this ever since Bill’s initial response, but didn’t want to jinx anything by mentioning it. And the guy was so friendly in both his emails and in person at PAX – I mean, he signed my friend Paul’s D&D rulebook with a drawing of Jason as a DM! – and gave some really fun and thoughtful answers for the interview that it was absolutely worth the wait while this thing unfolded, so it would be very cool of you to go read and and share it. 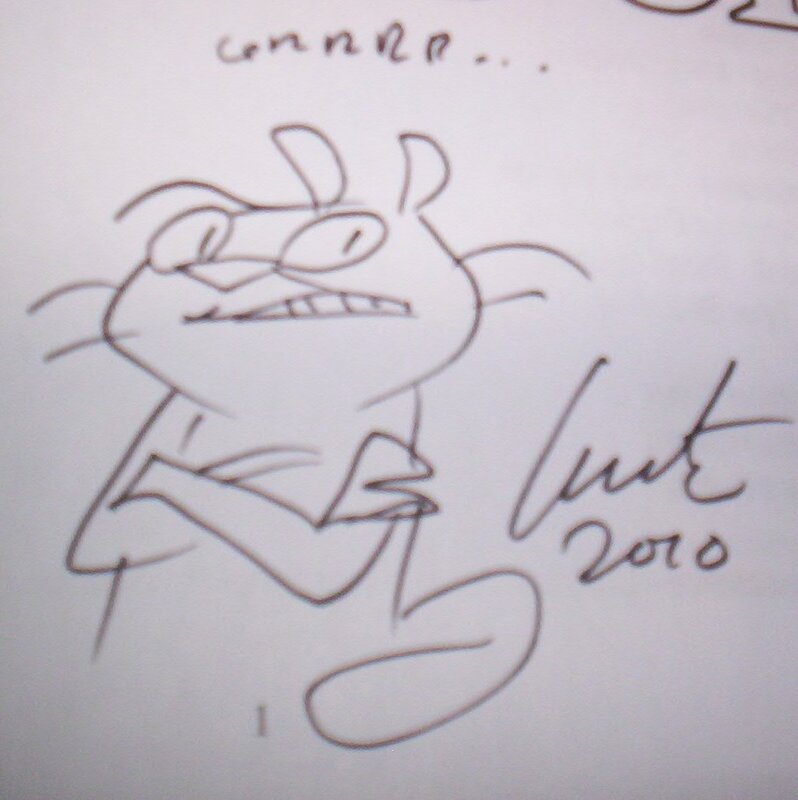 And as an aside, it’s not very often that as a fan, you have a chance to personally thank someone for the joy their work has brought you, so I’m grateful to Bill for both the two-plus decades of FoxTrot (which my daughter has also come to love) and for making that chance to say “thanks” not only possible, but truly enjoyable.